For several weeks I’ve found it impossible to get a post written, and difficult to even to download my camera. The reason? I’ve been enslaved by TOTH. Perhaps you’re familiar with this mighty force, which strikes in late summer and fall. It’s full name is “Tyranny of The Harvest”, and when it takes hold, It keeps me trapped in the kitchen for long hours and days at a stretch. By late afternoon, I have barely enough energy to cook a simple (and I do mean simple!) dinner, let alone get creative on the computer. I know what you’ll likely say: it’s a good problem to have. I agree. So I’m not exactly complaining…just explaining. Our garden has outdone itself, and the “waste not, want not” attitude that was drilled into my childhood psyche has been running in overdrive. Since mid-August my life has been non-stop food production: pickles, relishes, chutney, canned tomatoes, frozen tomatoes, plum butter, plum syrup, mulled plums, frozen soups and pesto of various types, more canned tomatoes…more plum concoctions… I’m putting so much food away that I’m beginning to feel like a giant squirrel. And now our harvest of hardy kiwis has begun. Yikes! To be honest, though, answering the call of TOTH isn’t the only thing that’s kept me busy this summer. I’ve been preparing the prints for my solo photography show, which opens October 15 and runs to November 30. I’ll be showing lots of new images as well as some of my old favorites. If you live on Gabriola, or if you have the chance to visit our island this fall, I hope you’ll check it out. Here are the details. 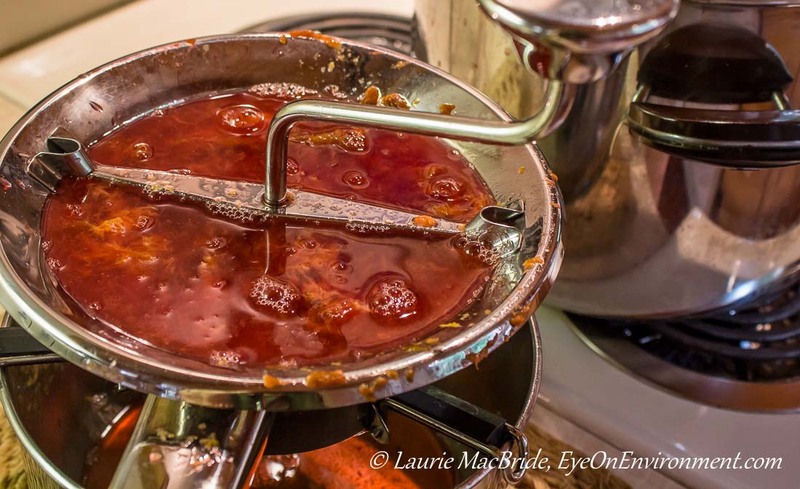 Posted by Laurie MacBride, Eye on Environment on September 17, 2013 in Garden, Musings on Life and tagged fall, food, food preserving, fruit, harvest, homegrown, homestead, photos. This is wonderful! I always envy those with a green thumb, I haven’t quite figured it all out yet. & congrats on your photo show, that’s great! Visiting you here from Sherry’s Still and All. I had to smile at your TOTH posting! The only things I ever harvest are herbs for the winter months! Thanks for the visit and comment, Sandra! I admit I am feeling rather overwhelmed by this year’s harvest. It’s the first summer we’ve stayed home for several years so of course my garden was more elaborate than usual – thus so was my resulting workload! So there’s a good chance that next summer my harvest will be a lot more like yours. Congratulations on your solo exhibit, Laurie! How exciting! I wish I could be there. I escaped the TOTH this year, but it will likely catch me next year. Love this post, Laurie, good luck with all your TOTH activities there! And congrats on your upcoming show, your work is wonderful and I am sure it’ll be a huge and raving success! Thanks so much, Toad. The show is coming up fast, but thankfully I’m mostly ready for it. In the meantime TOTH has kept me busy. Just finished another batch each of canned tomatoes and mulled plums. Tomorrow we’re juicing kiwis, our wine crop. It’s great, but overwhelming! I will cross my fingers for that day! It would be lovely to see you here – photo show or not! Thanks for the lovely comment Sherry.